Meanwhile lets just say that we are proud Carolyn contributed a whooping 279 entries. PIGEON FORGE, Tenn., May 9 — Four non-releasable female eagles cared for by the American Eagle Foundation at Dollywood in Pigeon Forge, Tennessee, have received some early and very special Mother’s Day gifts. The stately moms are named Liberty, Cheyenne, Boni Spae and Twilight, and they all have been blessed with recently hatched bouncing baby eaglets. NEW YORK — America’s eagle ambassador is taking to the skies over America’s greatest baseball parks, kicking off a new season of ‘America’s pastime’ with patriotic flair. ‘Challenger,’ the flying symbol of the American Eagle Foundation is in New York to fly over Yankee stadium tomorrow, April 8th, to open the team’s season and to honor America. Super slugger Barry Bonds enjoys a casual pre-game visit by American Eagle Foundation President Al Louis Cecere and Challenger, the celebrity Bald Eagle, in the Giants locker room at Pacific Bell Park. Once bordering on extinction, our national symbol is making a soaring comeback in forests nationwide. They’ve been together through both the good and bad times since 1993. Now, the most intimate details of their family life are being revealed publicly via live action cameras on the World Wide Web. 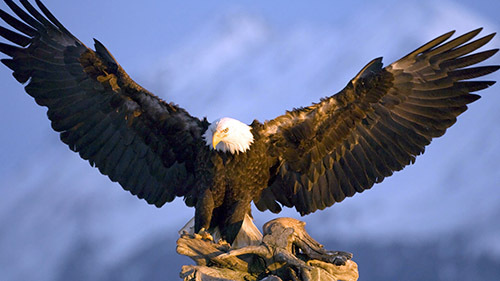 Challenger, the Bald Eagle, may be soaring to new heights of super-stardom during the coming year. If the non-profit American Eagle Foundation (AEF) gets its wish, the thirteen year-old free flying wonder will soon be featured in children’s books, a line of toys, and even on the silver screen. If those dreams come true, 2002 and beyond could be very prosperous for the U.S.A.’s freedom symbol. It turns out that Challenger is a very busy bird. The 12-year-old bald eagle, whose spectacular fly-over punctuated the national anthem for the first two games of this World Series, spent most of yesterday as a passenger on George Steinbrenner’s private jet. Owl-X (pronounced Alex), was found in January 1985 as an injured youngster on the Belle Meade golf course in Nashville, TN. He had fallen from his nest during a storm and impacted on his left side. Motivated by an Associated Press photograph that appeared in The Tennessean newspaper June 16, 1983 depicting 23 eagles that had been shot in the Dakotas by poachers, Al Cecere, founder of the American Eagle Foundation, experienced a life-changing moment that redirected his life and aroused his passion to save a precious species.